Coming out of the Paul Stuart lines is Phineas Cole. From what we see, it is a collection inspired by a turn-of-the-century aesthetic. 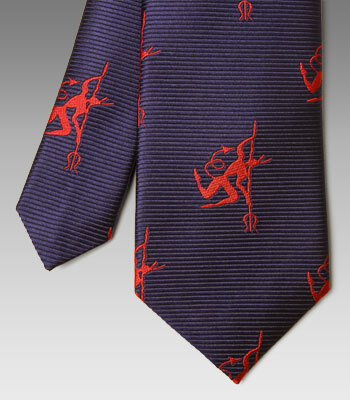 However, here we have a slight diversion from the norm with this Phineas Cole Devil tie. There’s nothing wrong with a little wink with your ties and when it is something as evil as the devil himself, it makes it that much more acceptable. In woven silk and 100% lined, this self tipped and tacked neck piece will have the whole office wondering who you really are. Don’t wear it to church. Available online. This entry was posted in Ties and tagged Paul Stuart, Phineas Cole, Phineas Cole Devil, Tie. Bookmark the permalink.